Ray was the second youngest son in a family of competitive axemen. Brothers Trevor, Merv, Rex, Doug, Ray and Bill would go down in history as one of the greatest woodchopping families ever. Along with their sister Margaret, their family grew up on farmland and bush near Deloraine and Westbury. Their father Albert, was a competitive axemen and bushman in the Wuamby bush district and it was natural that the boys followed his interest. Ray was a good all round axemen but showed a special skill in the tree felling. He won the Tree-felling World Title 4 times at the Royal Sydney Show. 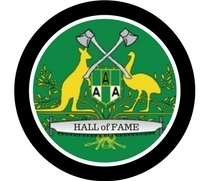 Won the Australian Tree-felling championship at Royal Melbourne Show 7 times. Set a World Record Time in the Tree (1min 22 2/5 seconds) at Ballarat in 1956. This is still the 3rd fastest cutting time. Won numerous Butchers Block events with brother Merv. Won many Standing and Underhand Handicap events. 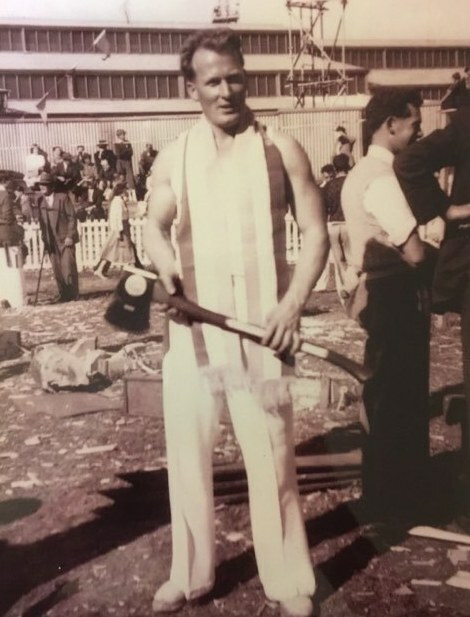 Ray was a regular member of the Tasmanian Team which competed against the rest of Australia at the Royal Melbourne Show in the 1950-1960’s. Ray was a timber contractor for Australian Newsprint Mills and Maydena. He suffered from Parkinson’s Disease in his later years and it was this that eventually claimed his life. The sport of woodchopping was in his blood and his talent and skill will be long remembered by those who observed or competed against him.